San Marino Historic Centre and Mount Titano are inscribed as a testimony to the continuity of a independent city-state since the 13th century. San Marino, an enclave surrounded by Italy, is a full member of the UN and is the last of 200 city-states that existed in medieval Italy. It is located at a strategic position on top of Mount Titano in the Apennines. Extensive restoration and reconstruction works have been carried out on the city centre in the first half of the 20th century. The local engineer Gino Zani was responsible for carrying this out. 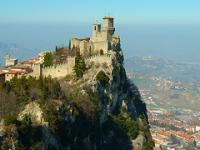 Although San Marino welcomes 2 to 3 million visitors a year, I am the first one on this website to give my review. Where do all these millions come from, one wonders? Probably they were on a daytrip from the nearby seaside resort of Rimini. My visit was during a weekday in February and there surely weren't many people around at that time. I started my visit with a hike along the ridge of Mount Titano. This path, starting from parking lot P3, takes about one hour and passes all three towers that San Marino is famous for. A fine but steep walk. There even still was some snow on the ground! I went to the interior of the middle of the three towers, Castello della Cesta. It has a weaponry museum (as castles all over the world so often have). The views however from the top of the castle are splendid: on San Marino town and on the surrounding snowcovered Apennine Mountains. The track ends at one of the city gates of the historical centre of San Marino. The centre is full of souvenir stalls and restaurants. It has a distinctive layout, all streets running east-west above each other. I walked around for a bit, and rested awhile at San Marino City's major landmark, the Palazzo Publico. That's about all there is to see here, in this very debatable WHS. ICOMOS praises its link between tangible and intangible heritage (freedom, representative democracy, republican government). In the Advisory Body evaluation San Marino however is compared to about a dozen other places, varying from Assisi to Singapore. Personally it reminded me a lot of Bellinzone (which also has 3 castles in a mountain setting). Despite warning on the “Beast from the East” in the news, after a lucky day in Urbino, I decided to take a gamble to visit nearby another World Heritage Site, the small Republic of San Marino. After I left Urbino, it was snowing heavily for the whole evening, fortunately I reached my hotel in San Marino safe and sound after 4 hours for short distance in such severe weather. I only hoped that the snow will stop tomorrow morning. It was snowing for whole night and still continued for the next day. I waited and waited until snow seem to be OK to walk outside. The whole country was under the snow and seem to be shut down as nobody on the streets and all the shops were closed, only government office still opened. I walked alone in the “winter wonderland” of snow and ice capital of San Marino. Many roads and pathway were full with snow. I tried to walk to the famous Mount Titano and San Marino’s well known towers, despite the sites were opened, the pathways to reach those attractions were almost inaccessible unless you were equipped with ski gear! The snow was so high that it reached my knees! I walked to tourism center to get the cheeky 5 Euro souvenir visa stamp on my passport, saw Basilica and the tiny parliament. After twice slipped and fell from the snow, I decided to stop and carefully walked back to the hotel. To be honest I was quite disappointed with San Marino, I did not see anything special in the city in terms of architecture or fortifications, it was quite similar to other old town in this region but the city looked more modern than I original thought. With some help of hotel staffs to clear snow from my car, I quickly left San Marino to Ravenna, at least I heard there was no snow in Ravenna to trouble my travel. Since I had no chance to see those famous fortifications of San Marino, I could not say much about this World Heritage Site, but for the historic town alone, I did not think it was worthwhile to explore, there was nothing much to see, there were a nice basilica and fine public buildings but nothing remarkable. The main characteristic of San Marino heavily relied on its location, driving to the old town via its many hairpin turns were quite challenging but gave an idea of this urban topography. Anyway San Marino has been inscribed by criteria III for its unique history of republic, so to rate it on visual architecture only maybe not a correct way to justify this site. Given my fascination with European microstates when I was growing up, it was inevitable I would one day visit San Marino, whether or not it was a World Heritage Site. This mountainous enclave surrounded by Italy prides itself on being the world's oldest constitutional republic, and nowadays thrives on tourism. I counted myself as one of the tourists in May 2013, when I took a day trip from Venice to finally see the republic. The bus ride from Rimini dropped us off at the lower gates to the city of San Marino, near the top of Mount Titano. After walking up the streets through the city I came to the Palazzo Publico, the central square with the Government Building and the post office selling both postage stamps and passport stamps. I enjoyed the views from the city walls, but the highlight of my time in San Marino was the walk to the towers on each of the three peaks of Mount Titano. The views from those towers were spectacular, and I appreciated the museum in the tower on Cesta, which showcased San Marino's history with the crossbow. San Marino was everything I'd hoped it would be, and it was an unforgettable stop during my European travels in 2013. Logistics: There are regular buses to San Marino from the Rimini Train Station in Italy, but the country and city can also be reached by automobile. A cable car connects the Sammarinese town of Borgo Maggiore at the base of Mount Titano with the city of San Marino. This is a precious fairy tale looking little town, up on a mountain, walled in, with fantastic views from a few of the pricey cafes on top of the mount or free by walking along the tiny winding cobblestones streets or the hiking path connecting the towers along the top. Near the entrance through the impressive gate, we enjoyed the Torture Museum, on 3 levels with lots of ghoulish instruments and stories of torture. Besides getting a passport stamp for several euros near the first tower, we enjoyed seeing the independence of the republic played out by the fully stocked gun shops in town. Not a typical sight in Europe, but comforting to Americans who realize Hitlers first major act was to disarm his citizens, and the freedom to bear arms was key to us winning independence from Britain as well as our newly freed slaves protecting themselves from KKK types in the late 1800s and early 1900s in the USA. Overall, we found San Marino to be a delightful stop on our exploration of Italy, and I found some lovely handmade scarves there! I visited this WHS in March 2012. 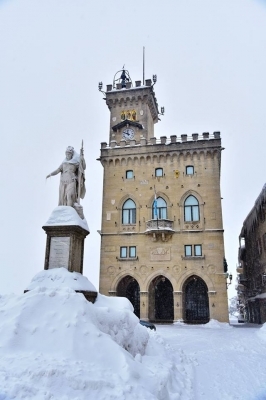 On Mount Titano there are 3 beautiful towers while the historic centre of San Marino is home to the Palazzo Pubblico which is a gem in its own right. Absolutely beautiful place, but so many people visit this site that it gets lost in a sea of tourist junk and trinkets. The streets are narrow and the paths are narrower...good luck moving around! There are no railways in San Marino, but there is a frequent bus service from in front of Rimini's train station to the Porta San Francesco. I travelled in the company of a bus full of Russians all intent on shopping for tax free designer label goods in the tiny Republic. I too wonder where the OUV is here. This site was a pleasant surprise. I didn't expect much more than a tacky collection of souvenir shops - which is what I got, but travellers to this tiny republic will also enjoy great panoramic views over the surrounding mountains, 3 impressive medieval castles, and a scenic old town with a collection of nice buildings. It may not be the best WH site in the world, but I have seen far worse. Its historic features, combined with its traditions of democracy, republican government, and independence stretching back many centuries, make it in my opinion a worthwhile World Heritage Site. We had already been to San Marino three times before, but we decided to return there this year in December because the previous times I was too young to remember well the town but also because we realized that strangely we had always limited our visit to a small portion of it, the most well known one. Before getting to San Marino remember that you may find a really strange climate or at least, as far as I can remember, we have always found it: a rainy weather, sometimes accompanied by strong wind, sometimes by fog, which doesn’t allow you to see farther than fifty metres, sometimes all that together. While planning your visit notice that the best existing “tourist guide” of San Marino is probably the WH nomination file: all the monuments are well described there so just take the information from there. Then remember also that it is really touristy at every season, with the streets full of people getting there almost always for shopping (and there are thousands of shops with lower prices and taxes), as it is demonstrated by the fact that you won’t find anyone in the remotest streets without shops, arguably even nicer than the main ones. If you go there by car, you will probably arrive from Rimini on a two lane road, from which you will get a beautiful view on the entire Mount Titano (naturally if it isn’t covered entirely by fog) with its characteristic profile with three peaks each crowned by a tower. If it is summer (in winter however it is the best option) don’t even try to park uphill because you won’t probably find a place, but park in Borgo Maggiore (there a lot of places where you don’t pay for parking so avoid the main parking lot) and take the cable car to get to San Marino. Possibly go there early in the morning to avoid the biggest crowds and if you would like to visit Borgo Maggiore, the centre of which is just a few metres from the main parking lot, go there later. 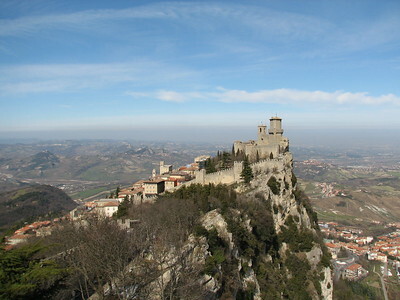 Borgo Maggiore itself is the second most inhabited municipality (or as it is called there, castle) in the Republic, with San Marino being paradoxically only the third one. It is a nice historic village, but as there are many other, nothing else: don’t spend your time there unless you have enough and you will get a beautiful view of the square from the cable car, from which it looks nicer than it actually is. Apart from few modest historic palaces, there is a church, a fountain, a long modern market portico and the clock tower, the most prominent landmark: all in very simple and humble style, almost rural. It is probably part of the WHS because it can be considered as a historic downhill quarter of San Marino: so not a bad decision to include it. San Marino is a very small town in dimensions, but what makes the visit of it quite long is the fact that it is situated on the quite steep slope of Mount Titano, and this makes it larger than it seems, because the streets run parallel on different levels. Not far from the upper end of the cable car is the main square, a beautiful space similar to a terrace, which offers, as many other points of the town, beautiful views on the surrounding hilly landscape. The nice Public Palace (a sort of parliament) and the Parva Domus palace overlook on it. The square was once a typically medieval space, but it was reconstructed in style and monumentalized in the 19th and 20th centuries; many other monuments in the same period underwent similar reconstructions and restorations, alongside with the construction of new buildings and the creation of new urban spaces, mainly directed by the local architect Gino Zani, who lowered the degree of authenticity of the town but gave it a very distinctive and rare character, celebrating as a whole the history of the republic. His interventions are particularly noteworthy in two areas: the Saint Agatha’s square, where the Titano Theatre is located, and the area of the Garden of Liburnes, the Cantone, the Crossbowmen’s Quarry and of the Monument of the Volunteers, where he created various staircaises, porticoes, gardens, monuments and open spaces. Near the main square is the Saint Marinus’s Basilica, dedicated to the founder of the town, a nice neo-Classical building, noteworthy because of its stylistic purity, above all in the interior; other nice churches are the medieval Saint Francis’s church and the Saint Quirinus’s church, situated outside the walls, with a strange monument dedicated to Saint Francis in front of it. Don’t miss the really unknown but beautiful street Contrada Omerelli, full of monumental buildings, perhaps the only really authentic and medieval street, looking like the whole town before the 18th century. Also noteworthy are the three walls (with nice gates), unusual because they are situated on different levels and one of them is outside the town itself. But what makes San Marino really famous are the three towers, the first two looking more like small castles, the third one like an isolated tower (all three unusually located outside the town itself), firstly because it is rare for a town to have three fortified structures, secondly because they are situated exactly on the three peaks of the mount. The first one is easily accessible from the town and is linked to the other two by a breathtaking panoramic path passing trough woods near the edge of the mount, offering beautiful views of the town, the surrounding landscape, the castles themselves and the other slope of the mount, which is more a steep vertical rock face, about 200 metres high. It is a pleasant walk taking about an hour. San Marino is certainly a place where one can spend a pleasant day wandering around the town (the visit took us about five hours), itself having some rare features, making it quite special, but not justifying enough its WH status. 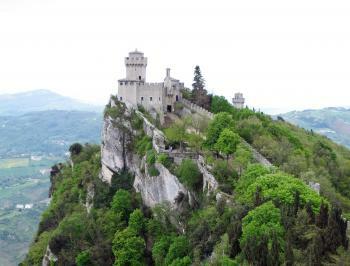 The real luck of San Marino is its most important characteristic: it is the capital of an ancient micro-state. Only because of this fact it is visited by thousands of tourists, only because of this it has its present reconstructed appearance and not the medieval one and once again only because of this it is a WH. In fact, its quite debatable WH status is justified by the great ideals of democracy and freedom that the town represent, to which UNESCO have always paid great attention, and, above all on another great ideal of the WHC: all countries should have at least one WHS inscribed on the WHL. Garibaldi: 1849. During the 1st Italian War of Independence and fleeing the Franch, Austrian, Spanish and Neopolitan armies he took refuge in San Marino whilst attempting to reach Venice. He was initially refused permission to pass through but turned up anyway with 1500 men when surrounded by Austrian armies. Went to Public Palace to present his request which was granted by the Regent. Initially staying in the Convent of the Friars Minor Capuchin he later escaped to Venice with 150 of his army. Built in the 13th century: Criterion iii: "uninterrupted continuity as the capital of an independent republic since the 13th century"